« 1980 – Apodaca Bros. Yesterday I finished surveying the last bit of Piedmont, the Appendix to my survey of Oakland, and so with this final sidewalk stamp my survey is complete. I will not undertake to survey Emeryville, Berkeley or San Leandro. However, I’ll be keeping my eyes on the ground at all times and places for various reasons. 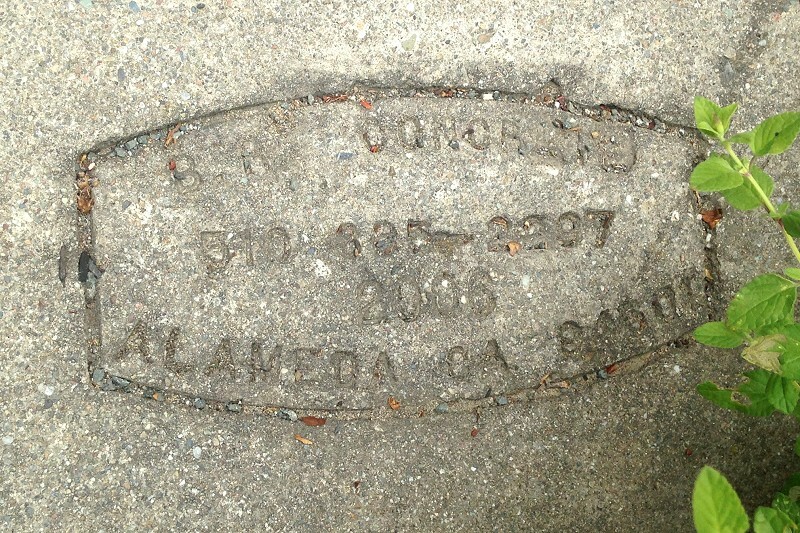 One is to scavenge any missing dates of Oakland sidewalk makers. Another is to determine answers to some nagging questions that didn’t occur to me until I was well into my survey, so there are reasons to stay alert even in territory I’ve already covered. And, of course, I’ll continue to document new stamps as they appear in years yet to come. I’ll also stay active in researching the different sidewalk makers. I feel like I’ve barely begun that part, although I’ve published 33 “Profiles” of them so far. It involves searching genealogies and old newspapers and directories, mainly. There’s also the whole larger topic of sidewalks as part of Oakland’s history, California’s history and the history of technology. Part of that research involves you, my readers. 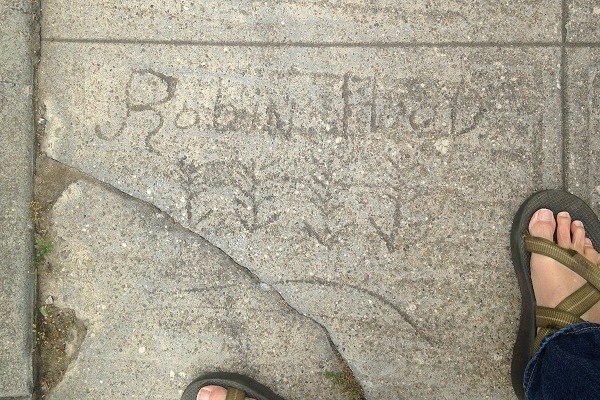 The people who made our sidewalks lived here, and many of them have living descendants in the area. Hearing from them in the comments to these posts has been a real joy. I stopped posting amateur concrete markings a couple years ago, but here’s one from my last outing yesterday that I couldn’t resist, from Blair Avenue in Piedmont. Signs and signatures like this are persuasive evidence that Piedmont really is part of Oakland. Those of you who remember biology courses may think of Piedmont as an organelle inside Oakland, like the nucleus or the mitochondria of a living cell. As a geologist, I think of Piedmont as an inclusion in the crystal of Oakland. If you’re a geographer, you may think of Piedmont as one of eight enclave cities in California. It’s also a city that managed to sequester its natural store of wealth, back in 1907, by avoiding annexation to Oakland. For every stubborn accumulation of wealth, there are Robin Hoods bent upon redistributing it. This is the kind of mark that the socialist Jack London, who spent time in both Piedmont and Oakland, could have made. That’s part of the energy within and between these two dynamic, fascinating cities. This entry was posted on 16 May 2018 at 10:53 am and is filed under Special marks, 2006. You can follow any responses to this entry through the RSS 2.0 feed. You can skip to the end and leave a response. Pinging is currently not allowed.